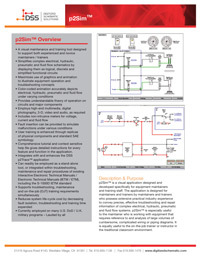 p2Sim™ is a digital schematic simulation application designed specifically for equipment maintainers and training staff. The application is designed for maintainers and trainers by maintainers and trainers who possess extensive practical industry experience to convey precise, effective troubleshooting and repair information of complex electrical, hydraulic, pneumatic and fluid flow systems. 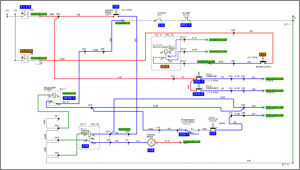 p2Sim™ is especially useful to the maintainer who is working with equipment that requires reference to and analysis of large volumes of cumbersome, complicated wiring or piping diagrams. It is equally useful to the on-the-job trainer or instructor in the traditional classroom environment. When you partner with DSS, you’re getting more than just software and training. You’re assured of expertise, custom solutions and our guaranteed commitment to excellence. Read what our clients have to say about Digitized Schematic Solutions. • Currently developing Digital Schematic Tools (DSTs) and technical documentation for the MRAP Cougar and Buffalo vehicles. • Provided publication and technical manual support for two of its construction equipment (HYEX and D6K). © 2013 Digitized Schematic Solutions. Web design and development by MSI Communications.